It’s over for another year. 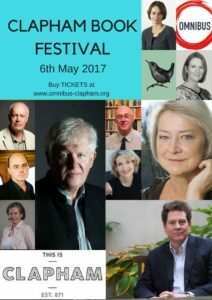 Clapham Book Festival 2017 can be consigned to history (at least it can be once the de-briefing meeting is over and a report compiled ). It was tremendous to do and to take part in and all the feed-back received so far suggests that it was pretty good to attend too. There are niggles – why couldn’t we offer a ‘Festival Ticket’, the web-site is cumbersome and navigation to buy tickets is unnecessarily difficult, why didn’t we have events in the Library? All valid points. How did this year’s Fest differ from last year’s? Well, it was organised solely by Clapham Writers, though working with partners, using Omnibus facilities and with Clapham Books in regard to book supply. This meant taking decisions was easier and compromises fewer, though it also meant that the responsibility was greater and any failure would be Clapham Writers own. There were financial risks ( lessened by the acquisition of a sponsor ) and reputational ones – what if we managed to attract all these top flight authors and no-one came to see them? Thankfully that was not a problem. We have established that there is an appetite for a Book Festival in Clapham, even on a Saturday after a Bank Holiday, when many folk were away. Although the final accounts remain to be calculated, the assumption is that we might make a small ( very, very small ) profit which will help with next year. And, it seems, there is likely to be a next year. We await box office data. The set-up was much more professional this year, with a logo, a printed programme and poster, a web-site, social media accounts and a publicist. There was quite a bit of pounding the pavements in Clapham ( it will be good to have Saturday mornings back again ). Volunteers were recruited to help with delivery on the day and creating the T-shirts gave us a recognisable identity. The events were of high quality, with authors who were prepared to engage in intellectual and sometimes difficult discussion, not just promote their book. This meant being well-prepared and stimulating, for the participants as well as the audience. Feed back from both groups would suggest that this was achieved. It involved a lot of work, falling to a small number of people and often to relatively short deadlines as the date approached. Next year one hopes it will be possible to recruit some specialist volunteers, in design, for example, as well as more folk to help in the run up to the Festival, not just on the day. One good outcome of this year’s Fest is the number of people who have offered to help next year. This isn’t the only lesson. Our ‘committee’ will be meeting on 18th to discuss what went right and what went wrong and how it could be improved and there will have to be a report to our sponsor. And tea and cakes all round. 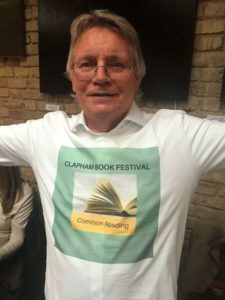 Look out for Clapham Book Festival 2018! This entry was posted in Books, Culture Vulture, London and tagged Books, London by juliej. Bookmark the permalink. Congratulations Julie, realise you put a lot of effort into the event, great it paid off. Thanks Barbara, sorry you couldn’t make it. Next year.